Hackney-based studio Ab Rogers Design has managed to squeeze a kitchen, bed and bathroom into this 19-square-metre concept apartment by creating a pair of plywood living units with space-saving details. 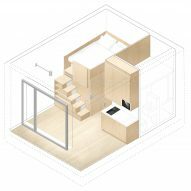 The prototype is displayed within the Westminster offices of property developers U+I, which tasked the architecture studio with condensing the functions of a traditional home into an efficient micro living space. 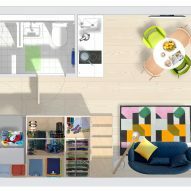 Prior to starting the Compact Living project U+I had been closely studying London's property market, and wanted to create a design-led housing option that was smaller in scale and more affordable. "It is time to re-think and invent a new way for people to live in the best parts of the city," said the studio. "The campaign led by U+I is ongoing, and will continue to challenge the perception that small is less." To maximise space in the apartment, Ab Rogers and his team decided to incorporate two multi-purpose living units. 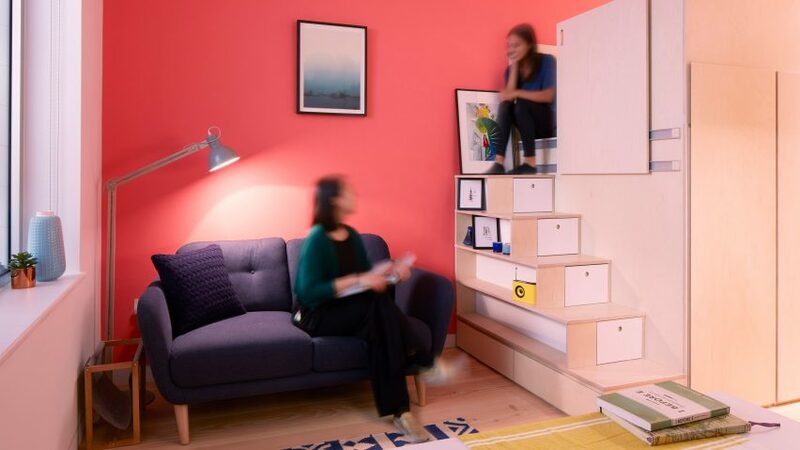 One unit features a set of stairs with drawers integrated into the risers. The steps lead up to a double bed, while underneath is a series of tall cupboards. A white-tiled bathroom sits inside the other unit, with a cooking area and extra storage on its exterior. Both volumes have been crafted from birch plywood and paired against light-hued timber flooring to evoke a "warm, comfortable, tactile nature". 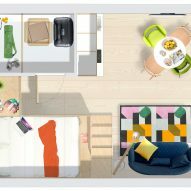 Half of the overall floor space has been left free of fixed elements so that inhabitants have the chance to personalise the apartment with their own furnishings or homeware pieces. The ceiling has been placed at just over three metres in height to keep the space from feeling too cramped. The apartment is also fronted by a large window that floods it with natural light – its chunky ledge acting as another spot for residents to sit and relax. Several other London practices have turned to micro apartments as a solution to urban living. Architects Emma and Ross Perkin created custom joinery to make the most of a 45 square-metre flat in Stoke Newington, while Gort Scott is currently constructing 45 "pocket" apartments inside a disused office block in Walthamstow. Photography is by John Short.